For my Secret Recipe Club post this month I had Melissa’s blog. She shares great sounding and looking recipes on her blog called Fried Ice and Donut Holes. While her blog is not a vegetarian blog she does have a great number of veggie friendly posts that look mouth watering. I have several recipes bookmarked for some healthy comfort food eating this fall and winter. When it came time to pick a make a recipe I had a very hard time because I had a whole list of great things like, Barbecue Chicken Pizza, Baked Pumpkin Donuts, and Creamy Chicken and Mushroom Pot Pie. In the end I picked the Spiced Black Bean, Grilled Avocado, and Goat Cheese Tacos. I simply picked these tacos to make because I was having a crappy, super busy week. I had these bookmarked since I loved how they could be a great recipe to use when I didn’t feel like cooking. Well, that is exactly what happened. I had just about everything at home so I just ran out for an avocado and some wine (since I really needed that as well) and was quickly on my way to dinner once I got back home. I made a few changes to the original recipe but I think you have to do what works best for you and you taste preferences/ingredients on hand/sanity. For example, I could not find coriander seeds at our grocery store so omitted them and decided to amp up the other flavors I did have. I switche using olive oil out for corn oil as corn has a more subtle flavor as a higher smoking point, which I figured would be best for the grilled avocados. I added some cilantro since I love it and always have it around (for us and the rabbits). I mashed my black beans as I like that texture and I figured that it would more easily stay in the taco to eat (while balancing a glass of wine on my lap and watching Parenthood). I really enjoyed these and since I typically have the ingredients around on hand I know I can always have a great dinner at the ready with some easy adaption. Rinse the black beans, reserve 1/2 cup of the liquids. 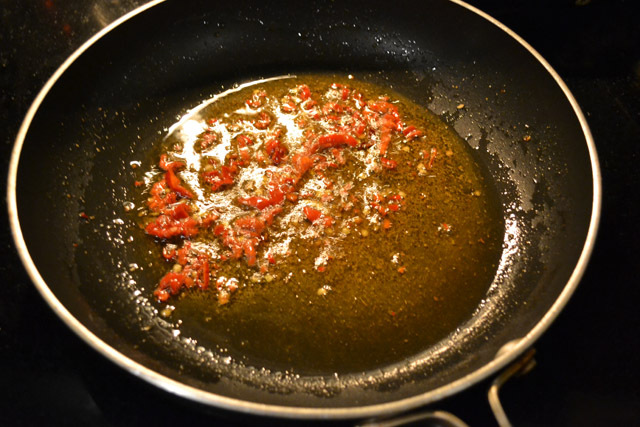 In a small skillet, warm the corn oil over medium heat. Add the cumin and pepper flakes. 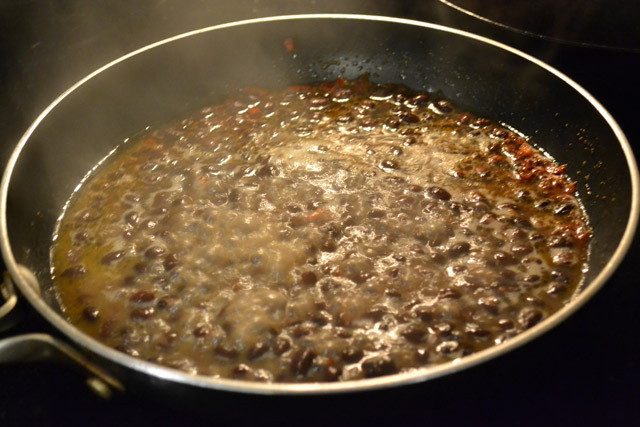 Once the spices have ‘toasted’ and are fragrant, add the black beans and liquids. Cook for 5-10 minutes on medium-low heat to reduce the liquids. Prior to preparing the tacos, mash up the black beans with a potato masher. 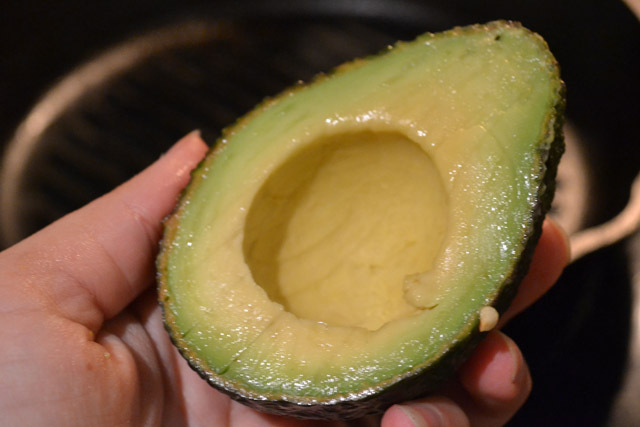 Cut the avocado in half, gently score to create slices, and brush with some oil. 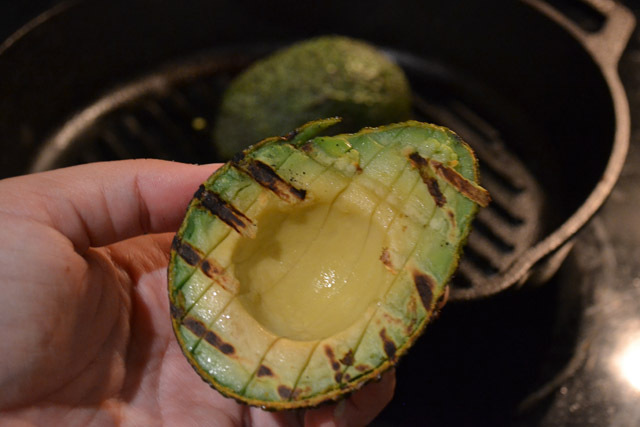 Put on a grill or grill pan on high heat just to char the outside of the avocado. In a small bowl, combine the juice and zest of 1 lime, the honey, and salt and pepper. So glad you liked these!! They are a favorite in our house, for sure. And I agree, they taste even better with a big glass of wine! I have a bunch of black beans and avocados sitting around. I might just have to try it! I would have never thought to grill the avocado! These tacos sound amazing! Love the idea of grilled avocado. Yum. Need to make these soon. We love black beans and avocados…this is right up our alley! Great SRC pick! These look fabulous! Great vegetarian option! Those look super delicious. I love avocado, but have never grilled it before. Yum. I love how the spices are toasted and the avocado is grilled! Yum, these look like awesome tacos! Great SRC pick!! Alternative tacos — love it! These look great. I would never think of avocado as the main taco ingredient.